I believed after so many travels and dozens of spontaneous trips to more than 60 countries all over the world, nothing can shock me anymore. To surprise me – Yes. To make me excited – Yes. To make me inspired – Yes. But I really thought there was no longer room for being shocked. Well…I was wrong. Amman, the capital of Jordan, managed to do it. I remained almost petrified after a short trip to Amman. Already in Amman, I found out how important is to keep the balance between expectations and reality. Otherwise the gap could be overwhelming. I have already been in Jordan. Six years ago, with a tourist group, I landed at Aqaba on Red Sea for approaching the most famous sightseeing nearby – Petra and Wadi Rum. It was a short programme with very hectic schedule. That’s why, after been in Jordan, I thought nothing could take me out of the balance. But six years ago I did miss to visit its capital – Amman, where several things shook me off and threw me beyond my expectations, completely dizzy for the rest of my stay. Landing at the shiny and very modern airport of Amman, Queen Alia, I was pretty much impressed by the facility. It’s new, officially operating for only three years, very clean and well organised. The road to the city is comfortable, flat, surrounded by palms and greatly maintained green spots. The first impression was for arriving at a wealthy, well managed and very clean country. This impression ends up with the final point of the airport road section. Amman looks stunning in the mornings. At least from above. But when you get familiar with the place, the picture somehow changes. I shared that impression with a local friend – Rasha. To me Amman was a semi-finished structure. Like it has started being built, but has never been completed, “frozen” at some stage of its establishment and abandoned at the same stage. Everywhere could be seen construction debris and forgotten assembling materials. Lots of cables, hanged over the buildings in chaotic, completely messy, no logical “order”. In general, the city causes sense of modesty and continence, not even a hint of luxury and pomposity, what I actually appreciated. And here comes the first drama. I should say, I am truly proud of my flexible and quite adaptable driving skills. My experience is mostly driving on the right side, but I managed to drive also on the left side in South Africa and Barbados. After driving in Beirut, Lebanon, which is a neighbouring country, I believed Jordan will be even easier. Briefly, I felt ready and well prepared to drive in Amman. Now, I am forced to admit, I can’t drive in Amman. During my stay I got several shotgun rides. From the front seat, I tried to observe precisely, to learn and find the logic of the local traffic. Unfortunately, it was causa perduta. 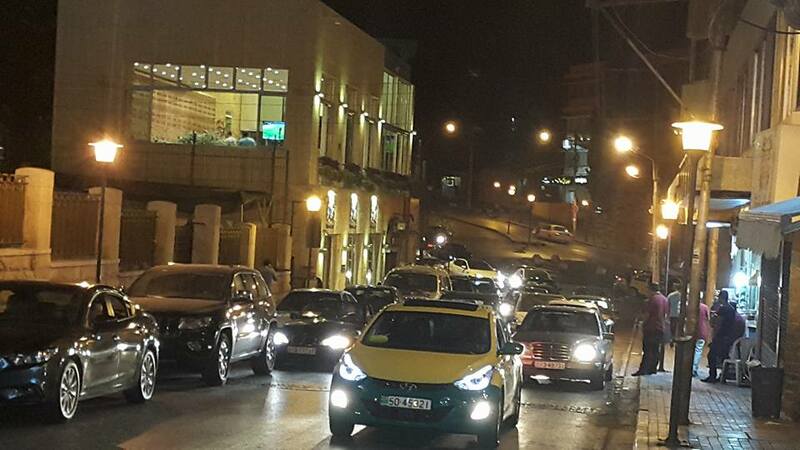 Simply said, I found it impossible to discover the essence of Amman’s way of driving. I did my best to get familiar with the local mentality and to somehow explain the lack of any traffic rules. In my mind, the most awful memorable traffic was in Cairo, Egypt. To the moment I faced the one in Amman. It definitely took the lead. No rules and no logic in here. I am still petrified by the reality. For first time in my life, after more than 20 years of active driving experience, I saw a driver to stop and reverse inside the roundabout. There is an enormous number of roundabouts in Amman. That’s why I believed, for having a driving license, the driver is obliged to know the rules, like who has advantage out and inside the roundabout, where you can stop, if you can stop, what’s not allowed. Being just a witness and passing through dozens of roundabouts, I already thought the local drivers don’t have even an idea about those rules. The roundabouts look mostly like a battle field, attacked from all the ways, just the attack signal remains invisible to me. Maybe it’s kind of a local spell or magic, not meant to be revealed to foreigners. I am still wondering how they were able to avoid the traffic accidents. 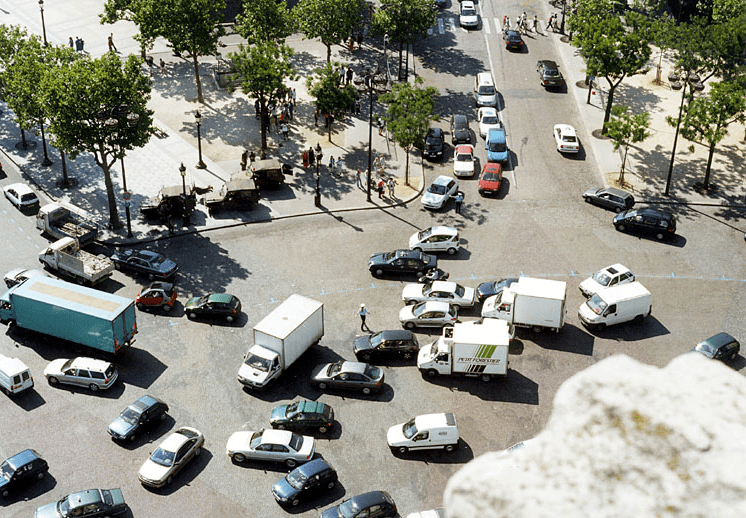 With this way of chaotic movement, every second car in Amman should be involved in an accident. In addition, I started respecting even more my friend Rasha, who is a cold blooded driver and obviously knows the local magic for passing through and still be alive. She reflected my complete shock with a smile and with the comment:”One day you just get used to it!”. Not sure I could ever get used to any lack of traffic rules and suicidal type of driving. Actually my experience as a passenger in Amman was about to reveal the main road rule, that handles all the traffic system. You just need to use the car’s horn as often as you can. As much you clack, as safer you are. 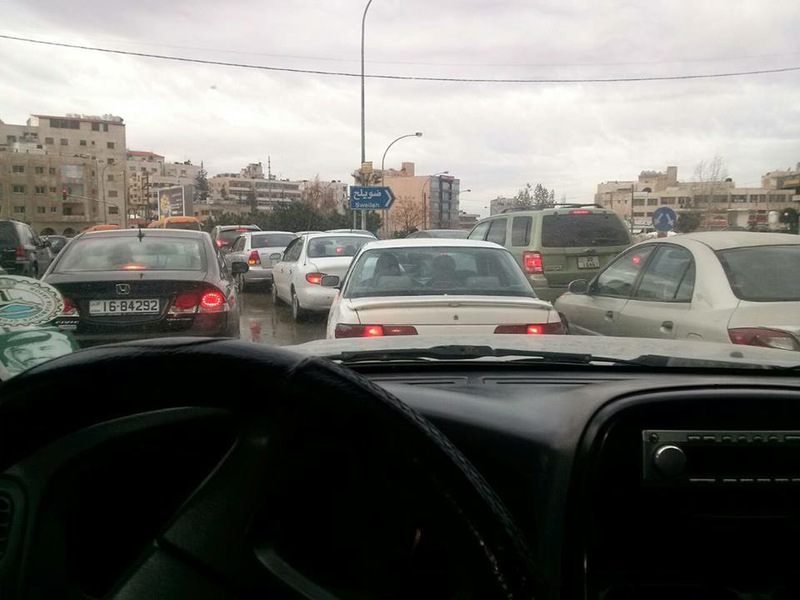 So, if you are planning to drive in Amman, make sure your klaxon works properly and is really loud. The other shocking feature of Amman – I consider it the most smoking city in the world. Everyone is smoking. Streets, restaurants, cars, parks, malls,… full of smokers. I can’t recall a memory of being at another spot, where so many people are addicted to cigarettes. Smoking in Amman is kind of a lifestyle, a life habit, a life routine. If it’s not about cigarettes, then is about shisha(sheesha). No one cares for a few suffering non-smokers around. Finally, I felt completely discriminated being a non-smoker in passionately smoking Amman. Expectedly, lots of refugees were in the capital, as Jordan was preferred as a peaceful island in the heart of the conflict in Syria and Iraq. The officials claimed only in Amman live about 200 000 Syrians and 50 000 Iraqi registered refugees. But it was only the official statistics. No one was certain about the unofficial. 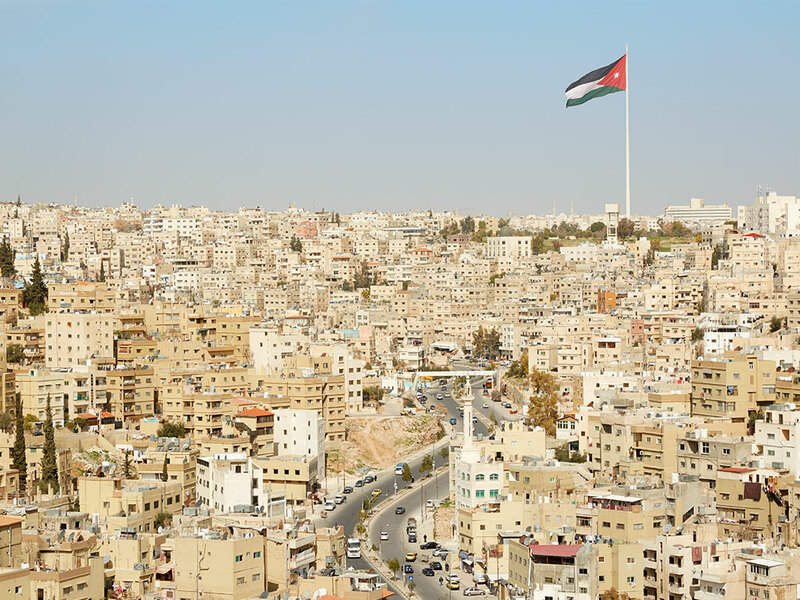 With population of about 1, 7 million citizens, the number of refugees in Amman sounds quite dramatic. Along with the refugees, arrived a lot of economical migrants from Afghanistan, Tunisia, Egypt, Morocco. They were searching for better paid jobs and the vast majority also supports their families in the homeland. 92% were young men, age 18-30, visible mostly at night. 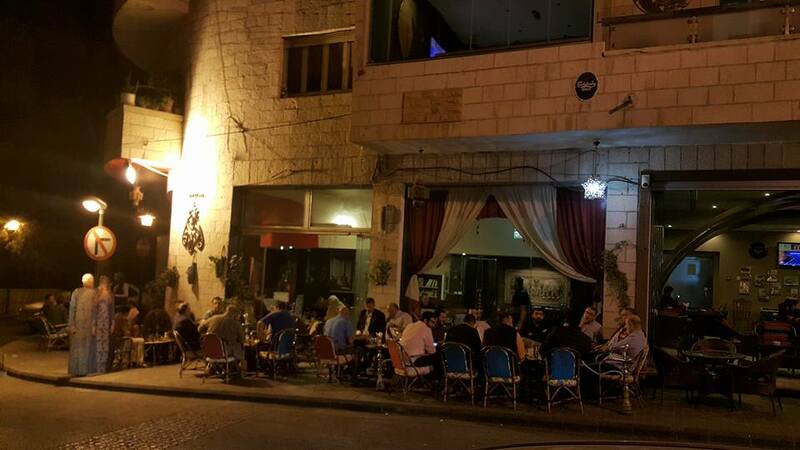 They occupy the downtown of Amman, playing cards and smoking shisha. At night Amman turns to a vibrant city, that never sleeps. Loud and colourful, relatively safe, it shelters all together the residents, the tourists and the refugees, who mingle in Al Balad, the old downtown, where are located the most of the street vendors and souvenir shops. I am not going to describe the sightseeing, as everyone could find that information online. 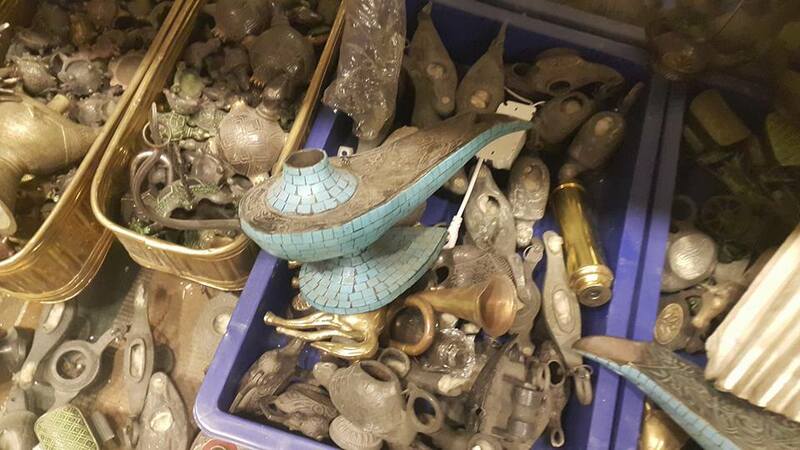 But there are a few peculiarities you shouldn’t miss in Amman. 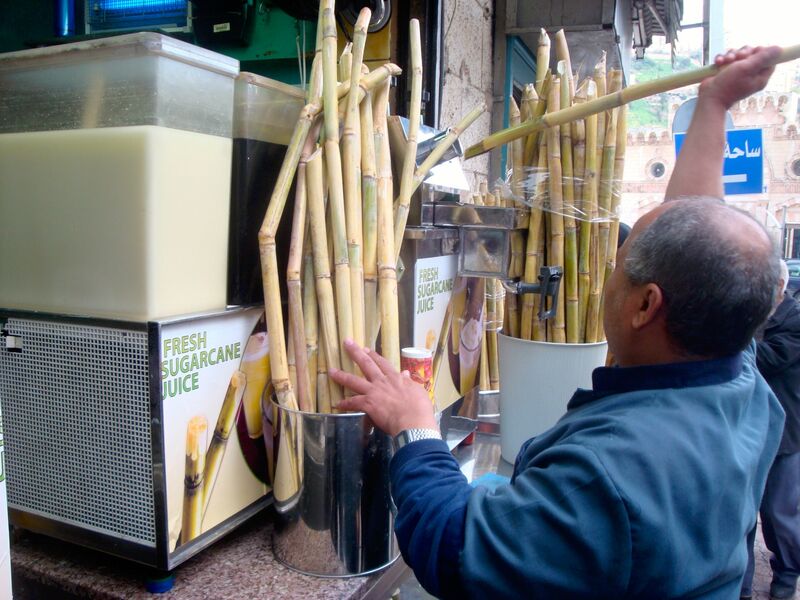 At very first place is the Sugarcane juice, with a pinch of ginger. You can buy it in Al Balad, where the juice gets prepared right in the street. The ginger supplement is optional. If you don’t like ginger, the vendor would skip it for your cup. Ambrosial!!! Not sure about the number of the calories inside, but it’s refreshing, cool, replaces any carbonated drink, much healthier and the taste is incomparable. Highly recommended !!! 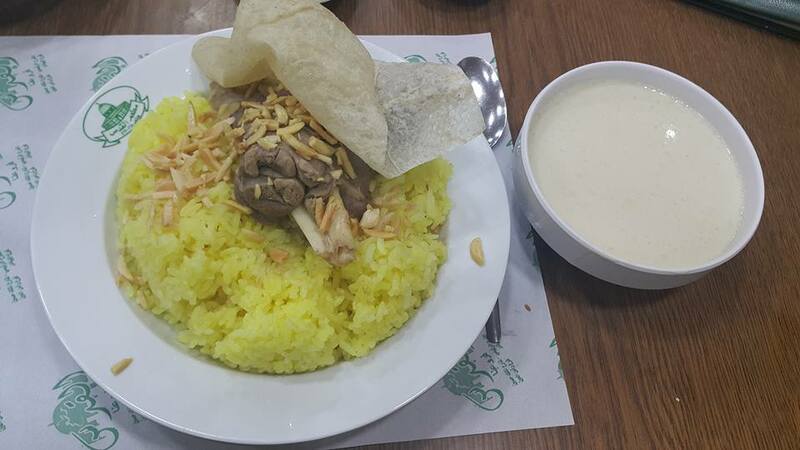 Do you know what Mansaf is? That’s the second local specialty you shouldn’t miss out. The taste is much better than it looks. 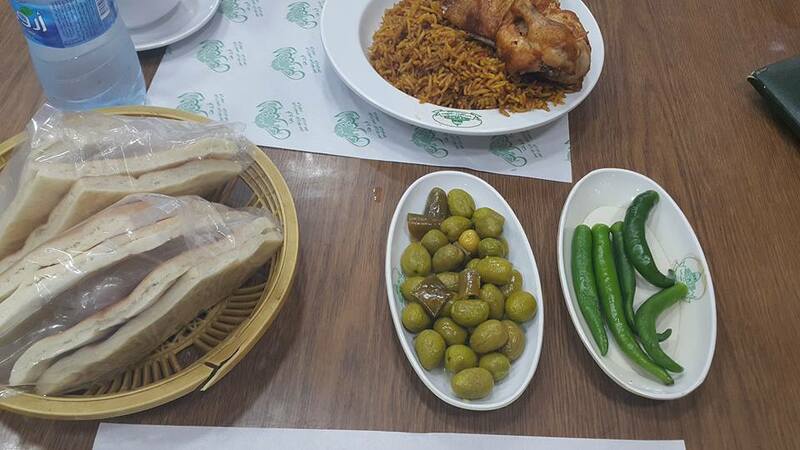 The traditional Jordanian meal, called Mansaf is the local pride. When I requested something typically Jordanian, all the locals reacted: “Mansaf”. I generally don’t eat rice, neither lamb, but could confirm it is highly delicious. In addition, I got a sauce bowl, that complements the dish – dry yoghurt, made into a sauce, called Jameed. On the top – nuts and bread, called shrak. It was literally melting in mouth. And the olives mezze …what to say….spicy green olives, a finishing taste touch. Highly recommended!!! Sure it was a joke, but those lamps, presenting the local culture, are really everywhere and seem to be a very nice souvenir or gift. Don’t forget to negotiate the price, always could be dropped. Do not accept the first offer. Remember, Amman is a remarkable part of the Middle East, where the negotiation is kind of art and both sides are meant to make some efforts to enjoy the operation as much as the outcome. 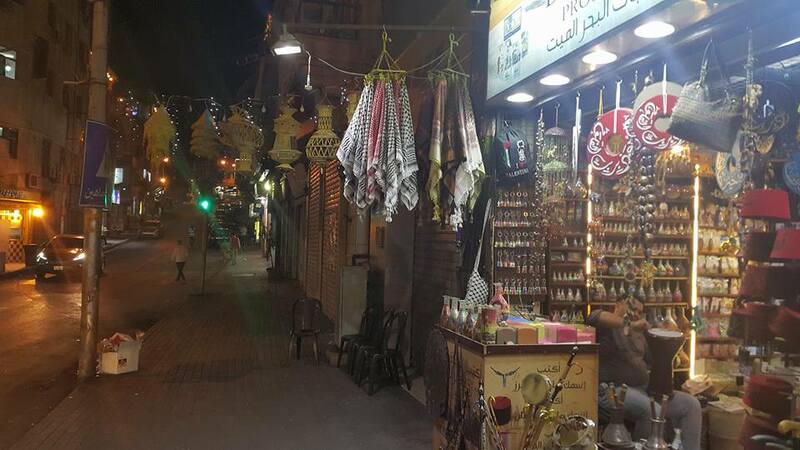 Summary – I didn’t expect to be shocked by so many peculiarities in Amman. Being quite familiar with the Middle East, I believed to know it well enough. Above I said of being petrified and it was pretty so. Amman is a spot that entertains its visitors and has lots to offer. Just be aware, it’s an expensive city and I would advise you to explore the opportunities online, before taking any decision. That way you would avoid being “petrified” and won’t duplicate my confusion of the trip to Amman, Jordan.